If you've been around Linux long enough, then you most likely will have heard about Fluxbox. Fluxbox is a desktop that was based on Blackbox 0.61.1, which makes it extremely light weight, fast, and reliable. Fluxbox is also very minimalistic which makes it ideal for certain situations. Although Fluxbox might seem somewhat lacking in the features of a standard, modern desktop, don't sell it short. 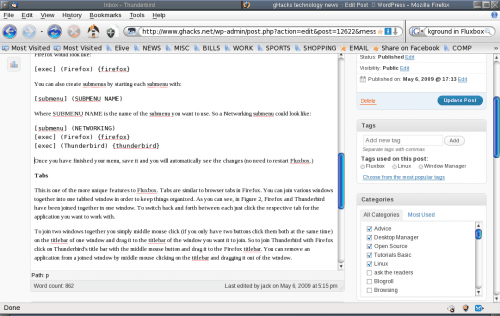 Fluxbox is easy to use and doesn't suffer from the bloat of other desktops. But just what does Fluxbox offer if it is so minimal? Believe it or not it offers everything you need on a desktop to get your job done. Let's take a look at the latest version of this old-school Linux desktop. Mouse menu: This is the only menu you will find on the desktop. Slit: This is a dock for any application that is "dockable". Toolbar: This bar (by default at the bottom of the screen) shows all of the windows of your desktop and contains the system tray, current workspace name, and more. Workspaces: Switch between different workspaces to keep your desktop organized. Tabs: Organize windows together into one or multiple tabbed windows to keep clutter to a minimum. Keyboard Shortcuts: Create your own keyboard shortcuts via simple flat text configuration. 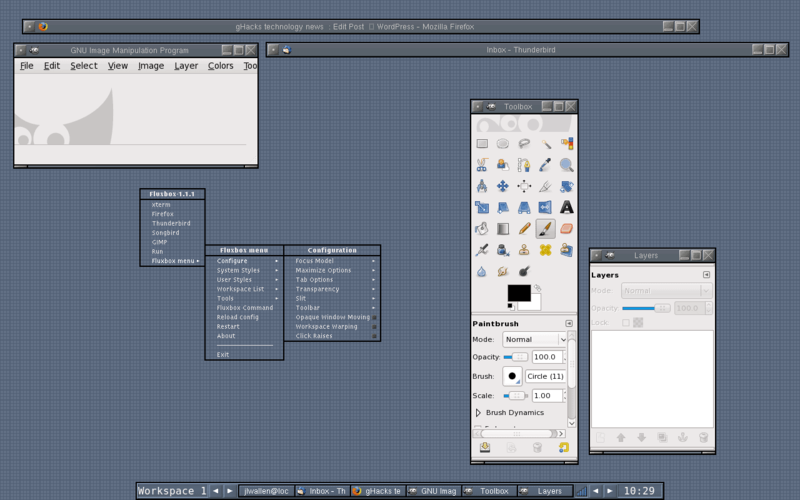 Figure 1 shows the Fluxbox desktop. As you can see it is, in fact, very minimal yet doesn't suffer from a loss of useability. By default you will notice a single right click on the desktop will bring up a rather barren menu. 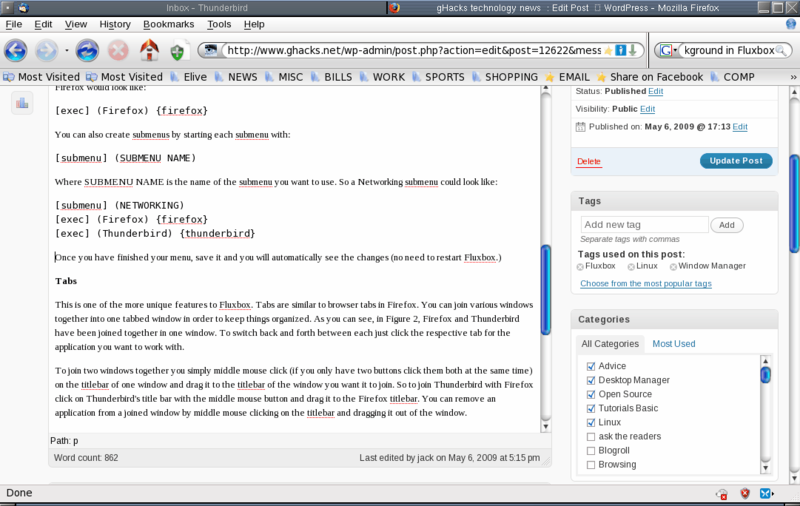 Figure 1 shows a menu with a couple of additions: Firefox, Thunderbird, Songbird, and GIMP. Adding to this menu is simple. One of the entries in the menu is xterm, which you will need to open in order to edit the menu text file. This is one of the more unique features to Fluxbox. Tabs are similar to browser tabs in Firefox. You can join various windows together into one tabbed window in order to keep things organized. As you can see, in Figure 2, Firefox and Thunderbird have been joined together in one window. To switch back and forth between each just click the respective tab for the application you want to work with. To join two windows together you simply middle mouse click (if you only have two buttons click them both at the same time) on the titlebar of one window and drag it to the titlebar of the window you want it to join. So to join Thunderbird with Firefox click on Thunderbird's title bar with the middle mouse button and drag it to the Firefox titlebar. You can remove an application from a joined window by middle mouse clicking on the titlebar and dragging it out of the window. Where /PATH/TO/IMAGE/FILE is the explicit path to the background image you want to use. In the case of the background, you will have to restart Fluxbox in order for the change to take effect. I get this question a lot. Who would want to use such a minimal window manager? The first, and obvious, answer, is anyone with an older or less powerful machine. Employing Fluxbox on a machine with less power will not gobble up precious CPU or memory leaving more for applications. I have deployed Fluxbox on kiosk and cafe machines that are used for specific purposes. Say you want to allow only the web browser to be used. For this you can alter the menu file to only include a web browser. That way the user can not run another other program (unless they how to get to a console window). Fluxbox is also a good window manager for anyone who prefers a very minimalistic approach to computing. There is little to get in the way of your work. And since Fluxbox is so reliable, you won't be worrying about your desktop crashing. Fluxbox is amazing, but Fluxbox + Ubuntu can be a hassle to deal with considering the screen resolution issues that everyone seems to have. I hope you go through all the semi-major WMs, it would be a good read. Goh Mifune: I plan on doing just that. I will get through as many of the window managers as I can. I’ve never tried Fluxbox under the *buntus, but it’s wonderful under Arch. I was surprised when I recently read about Fluxbox having descended from Blackbox. I used to use Blackbox with Windows XP several years ago. Fluxbox is lovely. It was the first desktop I ever used under *nix and I have used it ever since. Tried Gnome and KDE a few times but in the end they just seem so bloated and uncustomizable. I’m running fluxbox (under Debian) on my high-end desktop, so it’s not about saving precious resources – the desktop/WM is just that lovely and stable. I have two new, really powerful desktops & I have converted to fluxbox. KDE, XFCE, and GNOME gave me too much trouble: especially the keyboard escapes that worked that I had configured before an upgrade that no longer worked. And their configuration places were hidden. That is highly unable to happen with fluxbox with its text configuration files. for my memory stick and camera card once in a while. Tough.